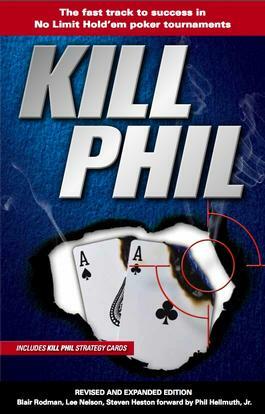 Thanks to television, the Internet, and the incredible popularity of the World Series of Poker in Las Vegas, when Kill Phil was first published in 2006, tournament poker had become the richest sport in the world. The problem was that No Limit Hold’em was dominated by a handful of experienced and skilled professional players. Kill Phil turned the tables on the pros by introducing a strategy that allowed even an absolute novice to compete against the best players in the world. The Kill Phil strategy remains highly effective when used in confrontations with even the world’s best players, but tournament play is evolving. This revised edition reflects the trends in tournament poker by refining the use of the all-in move and providing adaptations that take into account the new style of hyper-aggressive play. At its core, though, Kill Phil remains what it’s been from the start – the best method possible for entering the exciting and potentially lucrative poker tournament arena. • Learn an abbreviated system – the “Kill Phil Rookie” – that’s simple enough to be mastered within an hour and powerful enough to make you competitive in your first tournament. • Climb the Kill Phil ladder, learning more powerful strategies as you gain real-time experience. As a special bonus, this new edition contains the complete set of strategies formatted as they appear on the Kill Phil strategy cards – an added $14.95 value! Be the first person to tell us what you think about Kill Phil and you'll save $5 on your next purchase!